Our mission is to give our clients the opportunity to escape from the daily stress for a moment to recharge body and soul for the days ahead. During which, we strive to provide our employees a fun and learning environment in which to grow so they may help our clients to feel healthier, happier, and refreshed. This is a story about my experience and journey that led me here, to City Magnolia, that I would love to share with you. I hope one day we could meet and I could hear your story and your experiences! My name is Alexandra Tsoy. My journey began 20 years ago when I moved with my family from Kazakhstan to the USA. My family and I have worked hard to happily settle in our new country and were excited to start a new life. After 7 years of hard work, as it usually happens with physical and psychological stress, I injured my back and my shoulder. And so, I could not use my body nor hands as I once did. More than a year of rehabilitation was required. I was scared, the thought of quality of my life would never be same was terrifying, it seemed as though all hope was lost, dreams were falling apart and the dark times would never end. Looking back, I now realize, it was a blessing in disguise. During numerous doctor visits, I met many people suffering from similar problems. The thought of balancing work, stress, success and health of being nearly impossible was heartbreaking. I, personally, did not want to depend on drugs as they don’t improve the health nor do they give me the quality of life I always wanted for myself and my family. I started researching and trying to find a way out of this situation, I wanted and needed to understand if anything just anything at all I could have done more to prevent the situation I was in at the moment. Luckily, during my rehabilitation, I met a massage therapist who explained the healing aspects of a massage which I experienced first-hand! During the massage, I could feel how the built up stress in my muscle was softening with each hand stroke, I didn’t even realize how the hard muscles are the tensed muscles that built up over time because of the stress. Injuring and then meeting that massage therapist was my destiny. The whole experience has inspired me to become a massage therapist. Becoming a massage therapist required years of training and persistence. It was a long and a hard journey but I knew I would be able to help many people to prevent an injury I once received. Since becoming a massage therapist, I met a lot of different people and I realized that having just a massage isn’t enough, the effects of stress relieve could be significantly enhanced through mind as well. Of course the mind could be relaxed in many different forms but the combination of mind and the body is explosive! At City Magnolia Day Spa, our clients plunge into an atmosphere of relaxation from the moment they enter our spa where they receive the maximum results with treatments administered by qualified and caring therapists. Each therapist and each of our team members understand that our mission is rejuvenation and relaxation. Our goal is to give our clients the healthy lifestyle they work so hard on and the quality of life for which everyone strives. That is how we came up with “3 days of vacation in 3 hours”. Because not everyone could go on a vacation every week but the mind and the body need a vacation every week to function and to be productive. 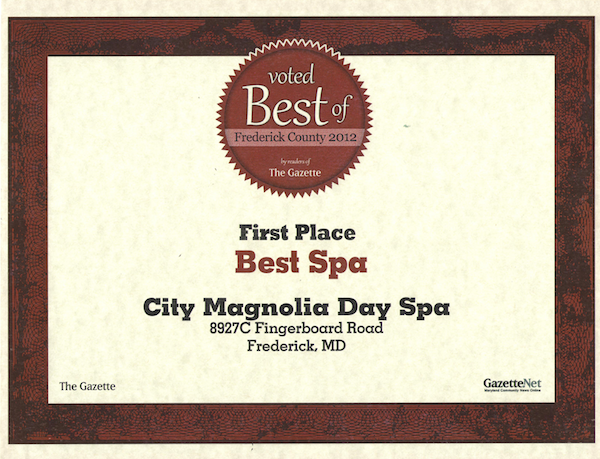 At City Magnolia, we give exactly that, the rejuvenation to your mind and body. I hope my story has inspired you to take more care of yourself. Our health depends on our daily habits. We all need a little help from time to time, to give our body and our mind the attention and relaxation they need and deserve. I believe the good health and energy of our clients brings positive changes to their families and through them to the whole world. I wish you to be healthy, happy, and that you love what you do, just like I do.